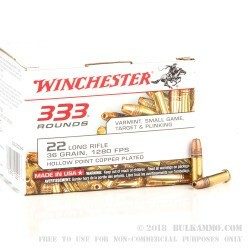 This is a single box of 333 rounds, perfect for an hour or so on the range. Great company. I will be back. 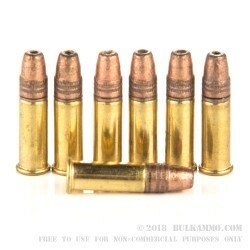 worst ammo I've ever used, don't use it in a semi auto gun. Failed to fire and failed to eject. Frequent jams in Intratec TEC-22. At first I thought, though they're 1280 fps, due to insufficient power. I now believe it has more to do with the flattened nose causing it to catch or stick on something and interfering with a smooth feed. Many FTE's in my Ruger SR22 Pistol! Run! Worst ammo I have ever bought. I tried these out on my accurized 10/22 and couldn't hit the broad side of a barn. This is coming from a gun that is a tack driver (single hole 10 rounds @ 50 yds). Even though I say buy it for kids plinking, I wouldn't even do that because I wouldn't want them to feel bad for missing shot that aren't their fault. Q: What does CPHP stand for ? A: Hello Thomas! I appreciate you reaching out to us about that! 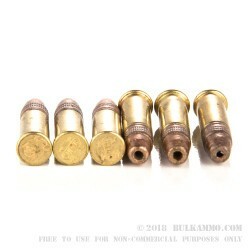 CPHP stands for Copper Plated Hollow Point.